Enjoy a groomed carpet without the expense of an electric power brush kit. Let the air from your vacuum system do the work by transferring energy to Turbocat's air turbine, belt, and roller brush, and then watch as hair and embedded dirt vanish away. Check the Turbocat Kit highlights and then test drive it for 30-days with our 100% Money Back Satisfaction Guarantee. Look over every detail of the Turbocat Kit. Deluxe and Premium kits are available. Premium kits have the same features, but the accessories and storage items have been upgraded. Click the links on the next page to see the difference. The Turbocat Kit is guaranteed to fit all systems without retrofitting. This means central vacuums not equipped with a rotating vacuum cleaner can now have one! Review your brand for more information. 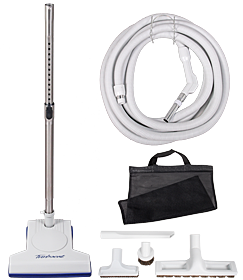 How does the Turbocat Central Vacuum Kit match up to compatible air-driven kits? "The Turbocat is great, very powerful considering its non-electric. Everything in the kit is very well made." Note: Turbocat is the same as and replaces Turbocat II, Turbo-Cat Plus, TL2000, T210, Turbocat V, VM179-B, VM179, Ultra TP210, Turbine 7160, 7161, 7210, RD-1990, HD-1990 Turbocat Vacuflo and all turbine brushes that look like it. The Turbocat vacuum head is also sold separately.